Back in business with a new belt drive for my bike and a new enthusiasm for me. I made my way northwest towards Glacier National Park of Canada on Highway 1. The good news, the views are spectacular, the bad news, this road is clogged with tourists as well as trans Canada traffic. Best advice, get an early start, before the big rigs get on the road. 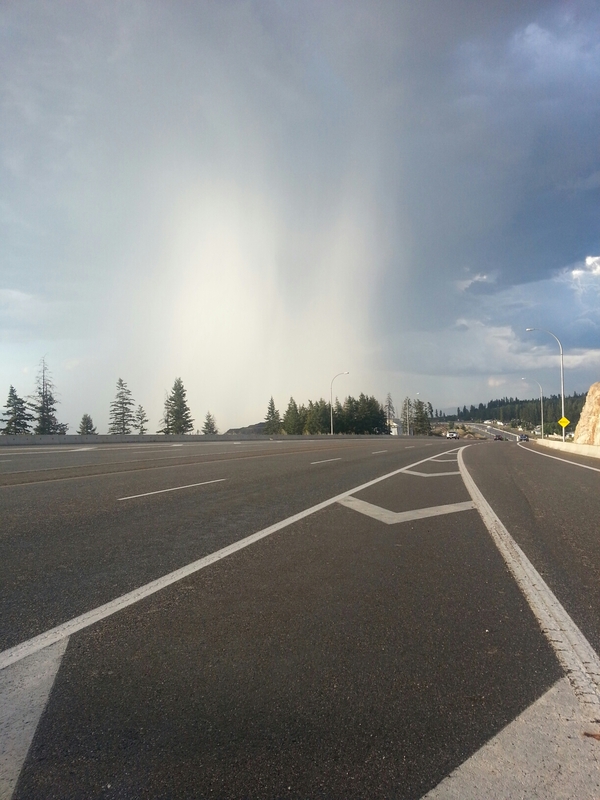 The other bad news, my detour delay put me on the edge of some sketchy weather. The locals were all complaining that this summer has been cool and rainy. The storms are slow moving, mostly visible and avoidable if you wait or change direction. Keeping with my flexible (translation: no reservations) travel planning, I found a private campground in Mara with an outdoor shower. Score one for the exhibitionist in all of us. The Provincial Park gate keeper suggested I try camping at Kakekkawa Falls. The downside, it is bike/cart-in and first come first served campground, a challenge for the flexible traveler. Several disappointed potential campers were leaving as I hiked up to the campground. Lucky me, I found a note on a campsite that suggested sharing the site, and the cost. Score! A young lady from Belgium saves the day. 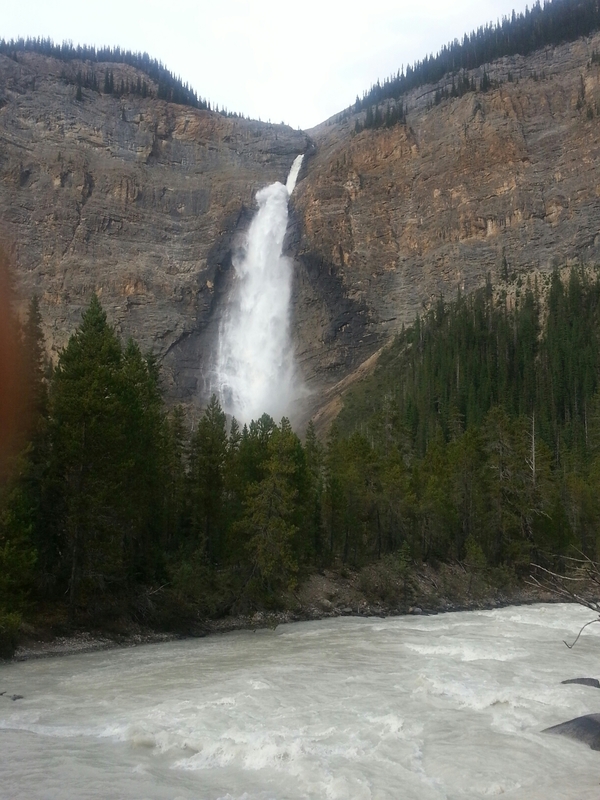 Added bonus, the second highest falls in Canada roaring all night. Also happening all night… drizzle. I remembered Lake Louise from my youth as one of the most beautiful places I’d seen of all the travels we did as a family. What I found was a very pretty setting choked with tourists. Even with the cold drizzle it was shoulder to shoulder. 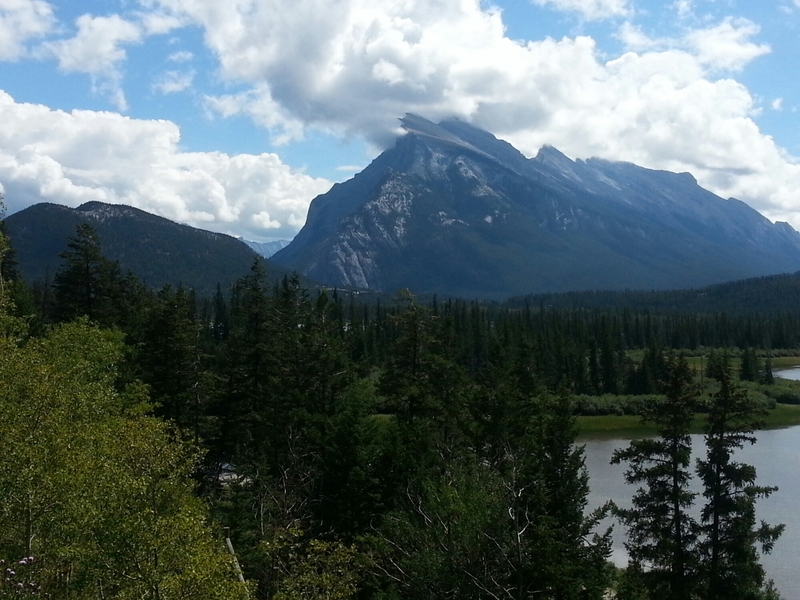 I quickly left and headed to Banff where, surprisingly, it was 67 and sunny. A good choice. I checked the weather radar and maps to see where the storms were headed and elected to swing out of the park towards Radium Hot Springs, thinking I’d cross the border at Roosville, pass back through Whitefish and ride Going to the Sun by motorcycle. You’d think a name that hints of radioactivity would deter tourism, but apparently not.I skipped by and saw a sign for a Provincial Park called Premier. Well, that I have to see. The sign didn’t say there would be a ten mile drive, five of it on gravel to get there. But, as expected, I found one of the last campsites. 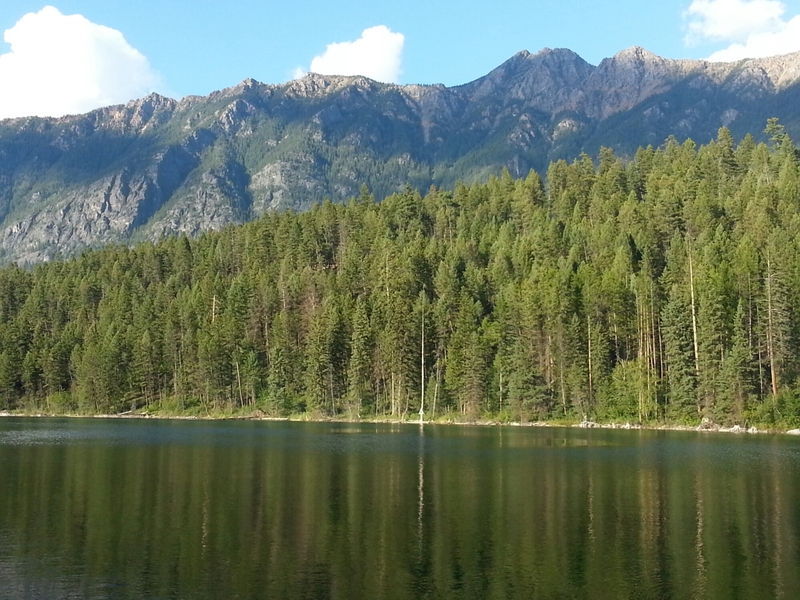 The lake is nice, maybe not premier nice, and I found out it is the hatchet for 40% of the trout stocked in BC. In the morning, the weather had me cut off from my intended route so I headed over the Crow’s Nest Pass, mostly beating the thunderstorms creeping up from the south and hanging over Glacier. My new destination: Waterton Lakes National Park, the sister across the border from Glacier. Naturally, camping was available for the lucky traveler. I did a couple of short hikes in Red Rock Canyon and went to a pretty corny ranger presentation on cougars. The message was that they are essential for keeping the deer population in check. I’m thinking of getting one. On the way back to the campsite, there was a smallish grizzly on the road eating blueberries. I slept with the bear spray close at hand. It starting raining the moment I got into my tent and didn’t stop all night. When I peeked out in the morning, I was horrified to see my motorcycle leaning way over. The kickstand was sunk three inches into the water-softened gravel. Another couple degrees and it would have been on its side. A disaster avoided. Packed up cold and wet and headed for the good old US of A, where there were hints of sun. 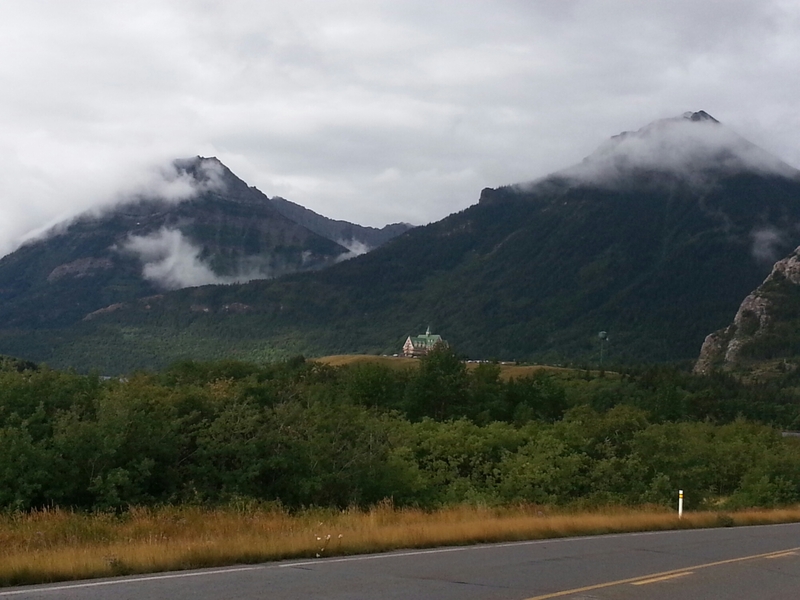 So long Waterton, you were beautiful. Next up: race for home. I had a nice, but short visit with my nephew, Ryan, and his wife Bianca. They are both expats working in the animation industry which is flourishing in Vancouver. The next morning Iskirted around the city center to avoid Lord Stanley Park, and the certain traffic jam on my way the Sea to Sky highway. As the name infers, the road climbs from the ocean to the high peaks of the Whistler/Blackcomb area. It is really hard to focus on the road with the stunning scenery around every curve. 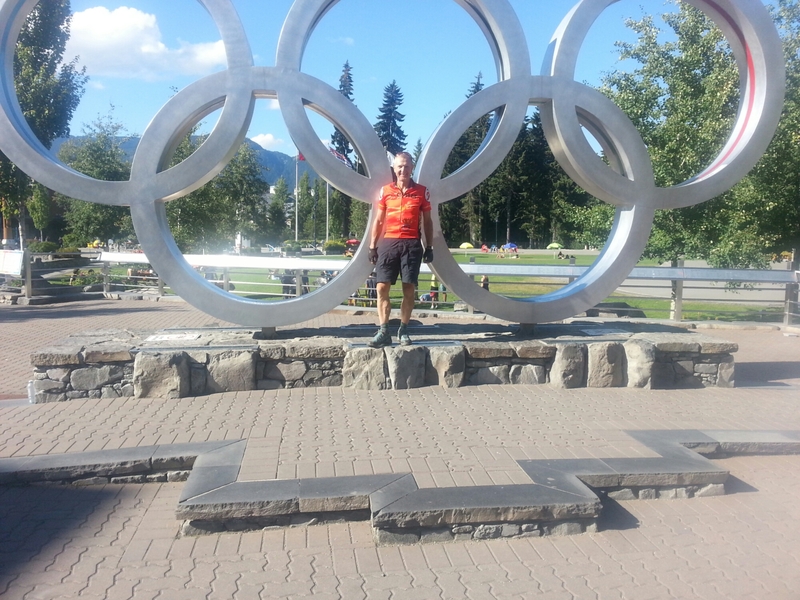 My destination was Whistler and the legendary mountain biking it holds. I found that whistler is a crazy busy tourist attraction. I found solitude at a campground twelve miles north and circled back to the village for a ride. I’d heard that the trail rating of BC trails is considerably softer than back home. I’m here to tell you that is an understatement. I’m very comfortable on blues and even blacks at home. Here, the blues gave me all I could handle. In my defense, the Fargo isn’t a true mountain bike, but no excuses. I only biffed once, but dabbed a lot. Trust me, I didn’t venture out onto the downhill course. There were hundreds of armor-clad, full face helmeted bombers flying down the snowboarding hill, jumping and skidding. Yikes! As you probably know, Whistler was the host for several of the Winter Olympics events and the rings are all that remain. 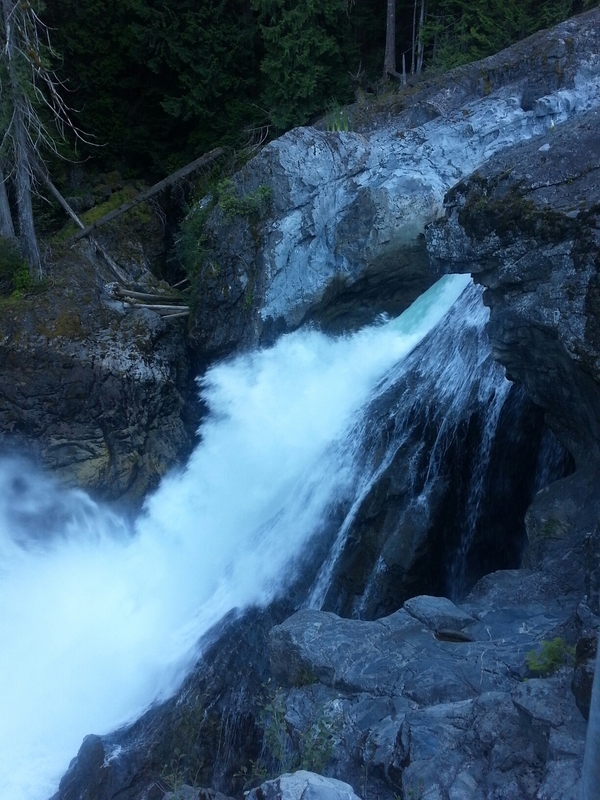 I went back to my campsite and hiked to the waterfall. The next morning I headed easterly from Pembrooke. The mountains here rose up, and they were massive! It was interesting how BC changed from giant mountains to Montana-like hills to northern Minnesota-like swampy lake areas. 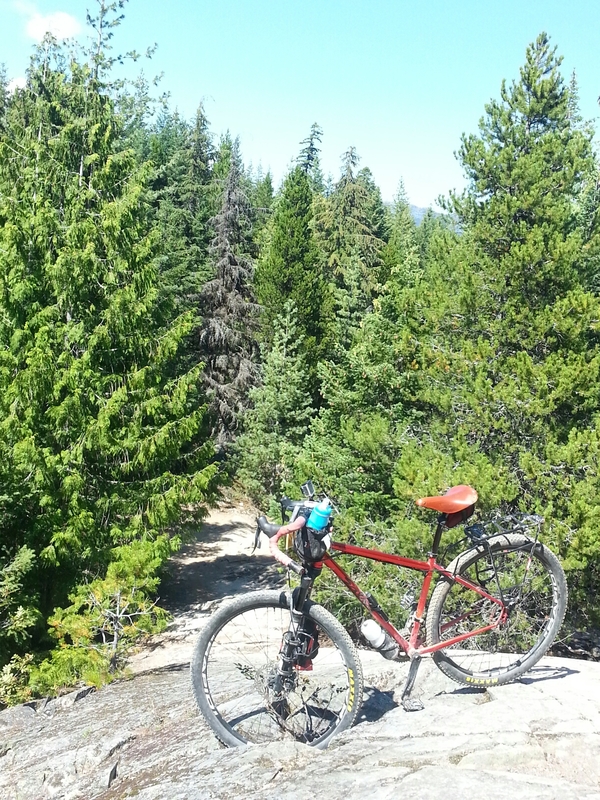 My next biking adventure was in Revelstroke, a smaller, more down-to-earth version of Whistler. The trails were equally as challenging but I was smarter now on choosing trails. I only fell off my bike a dozen times… and hiked more than a few sections. I won’t be scared at home anymore. Maybe that is a bad thing. My plan was to head northeast towards Jasper to ride the Icefields Parkway. A local had suggested that I should head up to Clearwater as there is a waterfall there not to be missed. That is where the trouble started…. I checked into a campground, set up my tent and headed three miles to Clearwater to seek out Mexican food. Leaving the campground, my motorcycle started making a clunking sound when I accelerated. Oh-oh. 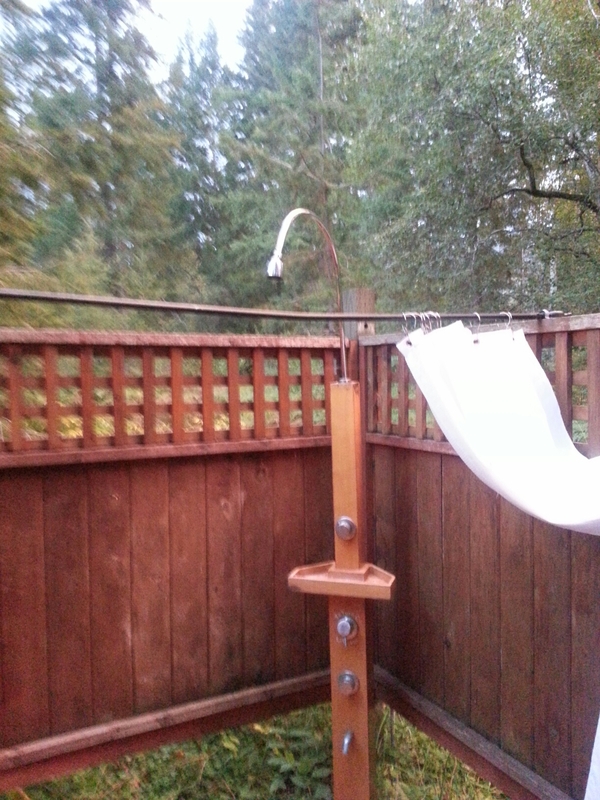 I stopped, put it up on the center-stand, rotated the wheels and have it a once-over but couldn’t find the problem. I stopped at the only gas station in town and asked if there was a mechanic who knew anything about motorcycles. You have to appreciate that this town is probably a couple hundred population… The kid behind the counter looked at me like I was speaking Swahili. A lady overheard me and said the only mechanic in town was in the car outside, her husband. This was the first of my chance encounters with generous Canadians. Quentin quickly deduced that my drive belt had missing teeth. My bike was dead in the water. Crap. Quentin loaned me his phone (AT&T service was non-existent) to call the BMW insurance provider I had fortuitously signed up with to get help. They said I could get towed up to 100 miles. The only motorcycle dealer of any kind within range was a Harley Davidson dealer in Kamloops. Harleys have belts so I elected to get towed there. There was indeed a towing company in town (Quentin’s son works there). Kevin showed up with a big truck, loaded my bike on, strapped it down and headed south. By now it was 10:30pm. We got to Kamloops around midnight, dropped the bike by the service door and went to find a hotel. Turns out, it was a big weekend in Kamloops, Ribfest and some big auto show. no rooms anywhere. 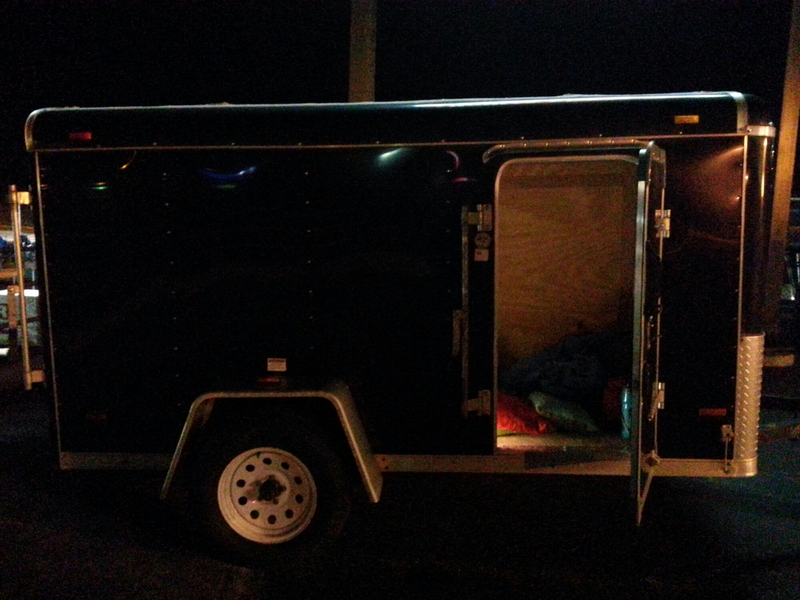 I ended up sleeping in an unattended trailer in the H-D parking lot. Actually not that bad, if you don’t get arrested. As soon as the manager showed up in the morning I explained my situation. He was less than positive. When the mechanics rolled in, I went through my story again. While they went inside to look at YouTube videos on how to install a belt, not reassuring. And, they don’t have a belt that matches BMW. The nearest BMW authorized dealer… Kelowna, another 200 kilometers south, or 120 miles. The good news, they have one belt. To expand my options, I walked next door to another motorsports dealer to see if they had options. There I met my Angel, Jacqui. She said it was a slow day because all their mechanics were at the auto show and she thought she’d help a stranger in need. 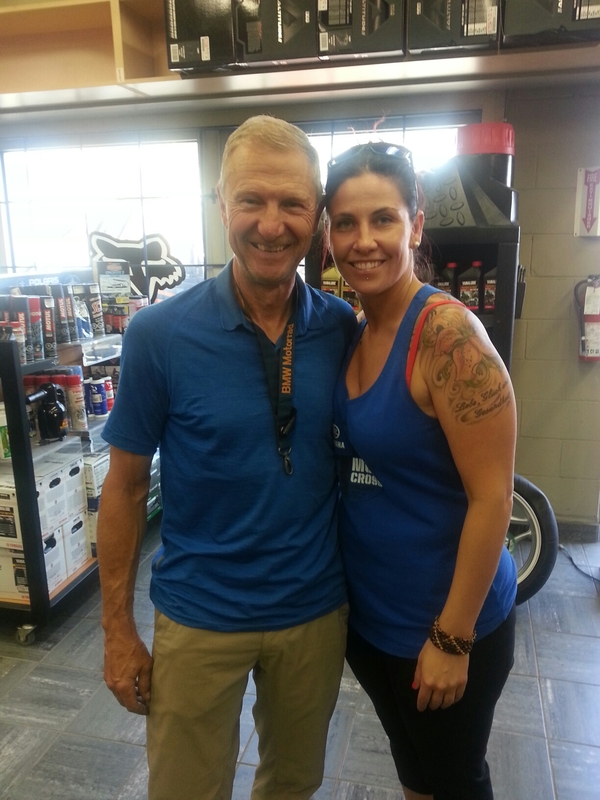 She made several calls, and decided the only option was to go get the belt and have an unfamiliar mechanic out out on, or get the bike to Kelowna. She even offered her car to me so I could go get it! I guess I look honest, or pathetic. In the end, she found me a Budget truck to rent, got me a ride to get it and sold me some straps to hold it down. Back at the HD dealer with the truck, I got help from another dude who just showed up at the dealership and hung out all morning. He helped me load and strap down the bike. I’m certain it never would have made the trip without his help. I drove as fast as I could to Kelowna as it was Saturday and the mechanic was going home at 3:30. I got there at 2:00, the belt was installed by 3:00 and, after dropping off the truck, riding my bicycle back to the dealer, I was rolling again by 5:00, just 24 hours after the disaster started. Quite a day… and, quite a testament to the generosity of Canadians. I won’t feel bad if Trump wins and I have to move there. The downside to the story is that I am now over 200 miles south of egret I wanted to be and the Parkway was looking less likely. Next installment… Chasing the Sun. 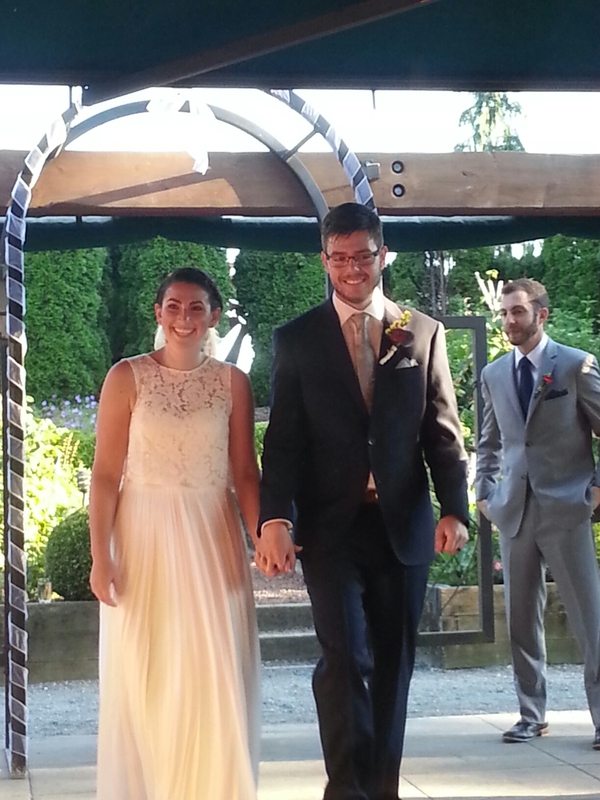 The wedding in Seattle was simple and elegant at the same time. Saturday, I had a nice ride with Don DeVeau along a trail that circumnavigates Lake Washington. We started at Washington University, the other UW and did an out and back 29 miler. We got to catch up on happenings in each other’s lives and I got to stretch my legs. 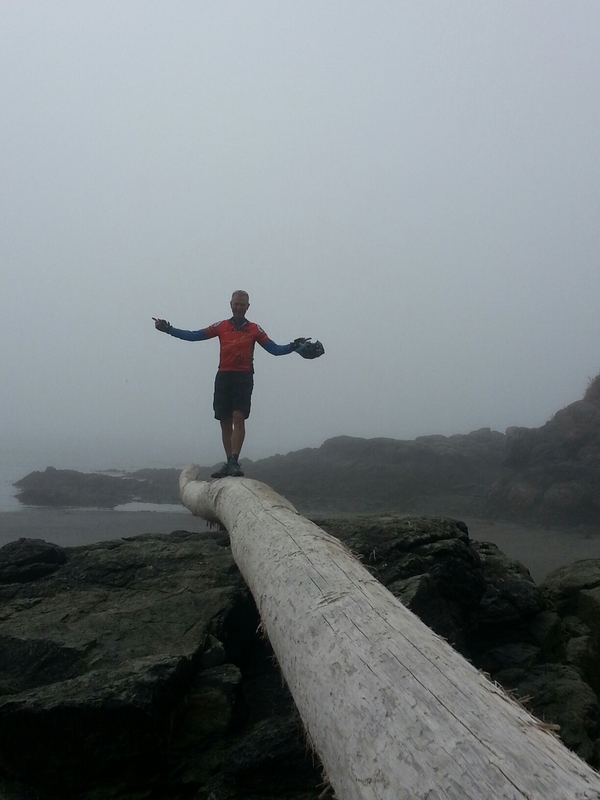 Next up: San Juan Islands… My Divide buddy Jim has a brother who lives on Shaw Island in the San Juans and he was generous enough to allow a stranger to come and stay with him. Shaw Island is a small, very non-touristy island. It only has 200 residents and two renters, one of them my host, Randy, and his wife Sue. They told me the island had everything from blue collar folks to Bill and Bill Sr. Gates. I didn’t meet them. To get to the Island, you take a ferry from Anacortes, coincidentally, the starting point for the ACA TransAm bike route. I saw lots of cyclists starting their journey at the ferry terminal. I loaded my motorcycle rig aboard and settled in for the hour-long ride. Shaw has an unchecked deer population, not what a motorcyclist likes. A short five mile, slow ride found Randy at the end of the driveway waiting for me. The house they have rented for ten years has a great view of the channel where you can watch the boat traffic and wildlife. Nice. As soon as I arrived, my hosts asked if I wanted to go crabbing with them. Of course! We jumped into a zodiac with another house guest, Brad, and motored off to pick up two other crabbers around the point. The process involved finding your crab pot buoy, pulling up about 80 feet of rope with a cage, hopefully full of crabs into the boat. Then the fun starts, you carefully grab the crabs, avoiding their strong claws, turn them upside down to check for male/female (females go free), and measuring with a gauge across their shell to see if they are large enough to keep and throwing them into a bucket. I took my turn pulling and sorting for the whole experience. Back at the house, we cleaned and steamed the crabs right on the shore for a wonderful welcome meal. I could get used to this. My plan was to use their house as a base to explore other islands. Randy and Sue directed me to San Juan and Orcas as the best samplers. 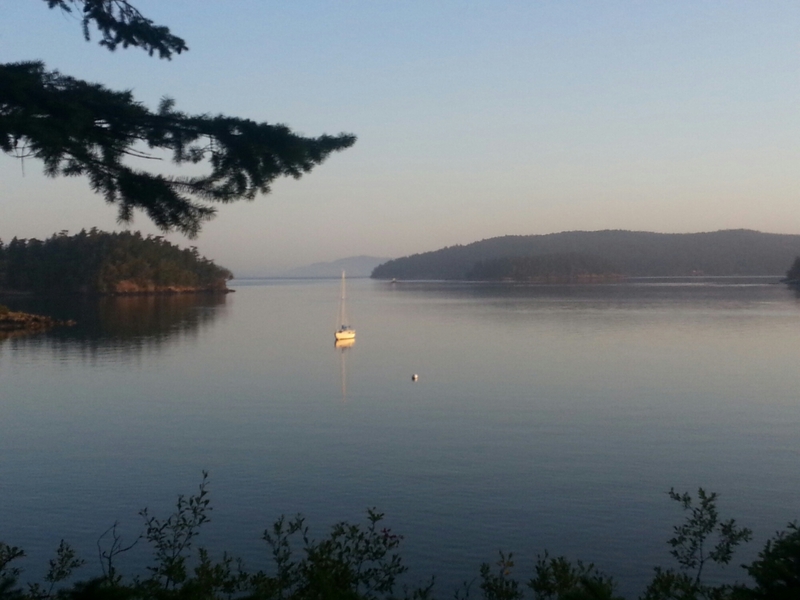 In the morning, I rode back to the ferry dock, bound for San Juan Island. San Juan is the largest and busiest island, the docking point is Friday Harbor. My new pal, Hardy, I met at the ferry dock suggested parking my motorcycle at the school and riding clockwise around the island. This would take me to the beaches on the south end, the Lime Kiln park on the southwest (whale watching site) and then Roche Harbor on the northwest coast. Unfortunately there was a dense marine layer making the sightseeing less spectacular. But, it was a nice day, the roads were not crowded and I was in my element. The view from the beach. 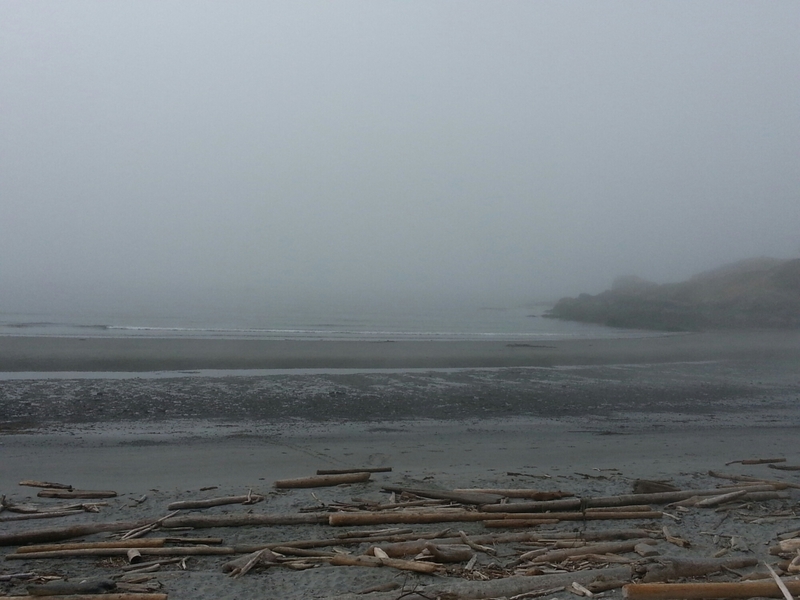 Naturally, there were no whale sightings as you could only see a hundred yards out into the fog. Can you see the kayakers? It did clear as I rounded the north end and into Roche Harbor, home of the rich and famous. 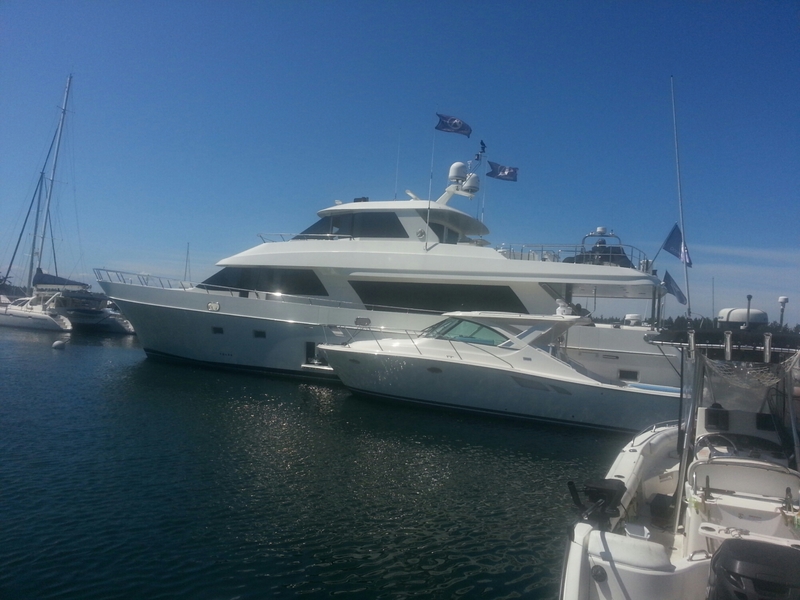 I got to board and your a $495 Million, yes Million, 90 foot yacht. It’s the bigger one.. I had a lamb burger, yes, it’s that hoity toity and left for the final circuit back to Friday Harbor, 42 miles and a great day. The next day, I decided to go to Orcas, another large and popular island, only a ten minute ferry ride from Shaw. The weather was cool (50’s) and cloudy. I elected to explore the island by motorized bike. 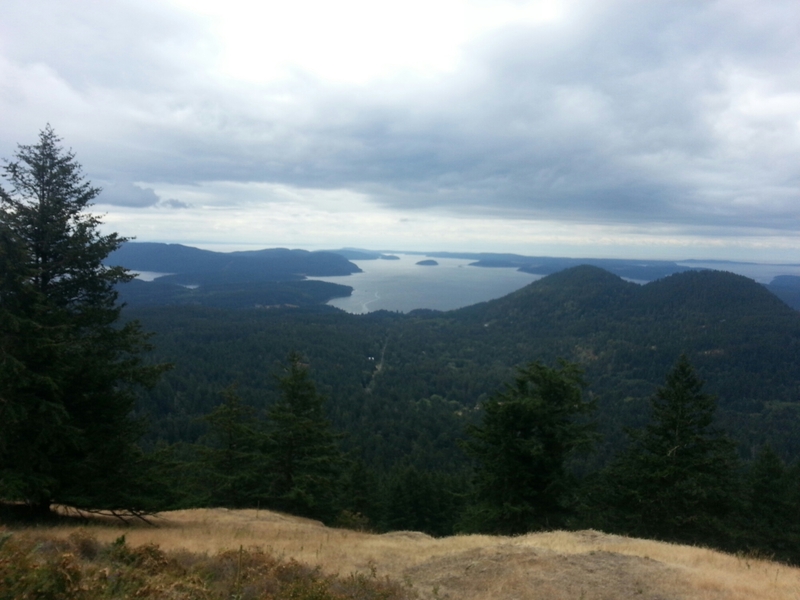 The high point, literally is Constitution Mountain, a long and steep (13%) climb to a great view around the island. 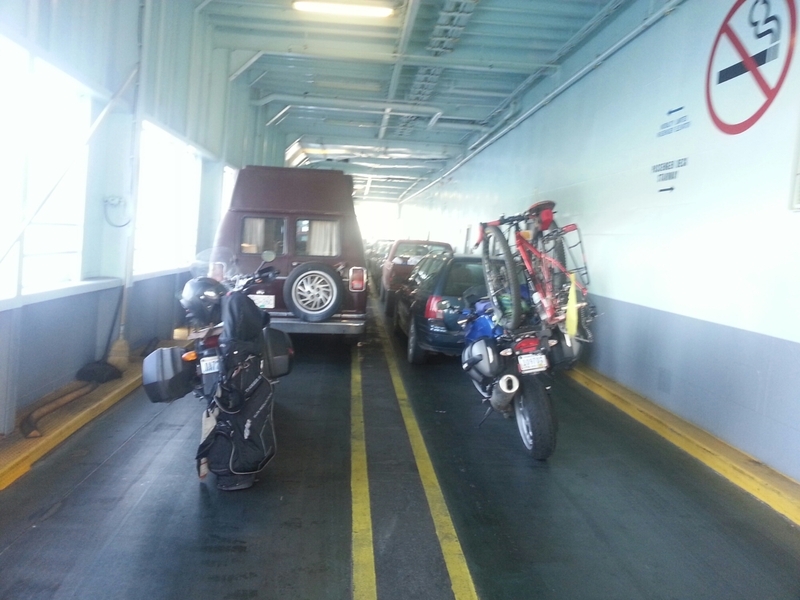 I ventured out to the far edges of the horseshoe shaped island and made it back to the ferry just in time to ride on. The next morning I caught the ferry back to Anacortes and headed up to Vancouver to visit my nephew.